WEST LAFAYETTE, Ind. and CHICAGO, Dec. 5, 2017 /PRNewswire/ -- Producers expressed lower sentiment toward the agricultural economy in November on the heels of fall harvest, according to the Purdue University/CME Group Ag Economy Barometer. The November barometer read 128, a 7-point decline from October's 135 and the second-lowest reading of 2017. The barometer is based on a monthly survey of 400 agricultural producers from across the country. "The November slide in sentiment was primarily driven by reduced optimism about the future," said James Mintert, the barometer's principal investigator and director of Purdue University's Center for Commercial Agriculture. "We saw the Index of Future Expectations fall by 10 points, while the barometer's other sub-index, the Index of Current Conditions, held steady at 129." In one of the survey questions, producers were asked whether they thought the next 12 months would be good times or bad times financially for the agricultural economy as a whole. Sixty-two percent said they thought the next 12 months will be bad times financially in U.S. agriculture. The percentage of producers expecting bad times in agriculture has been increasing since July when 50 percent of survey respondents said they were expecting bad times. Throughout 2017, survey respondents have been asked about agricultural trade in an effort to understand how proposed policy changes might be impacting producer sentiment. When asked about the importance of agricultural exports to the overall U.S. agricultural economy, 96 percent rated them as important. The survey also asked producers about the North American Free Trade Agreement (NAFTA). "When we asked producers about NAFTA specifically, they were less confident about its importance to the U.S. agricultural economy," Mintert said. "While 70 percent did rate it as important, a substantial 20 percent rated NAFTA as neutral, meaning neither important or unimportant." On a regular basis, the survey asks respondents about their expectations for farmland prices. For the first time in survey history, more producers said they expect higher farmland values than lower farmland values. Twenty-one percent said they expect farmland values to turn higher in the next 12 months, whereas 62 percent thought values would remain unchanged and 17 percent expect lower farmland values. Read the full November report at http://purdue.edu/agbarometer. This month's report includes additional information both sub-indices, farmland values and trade. 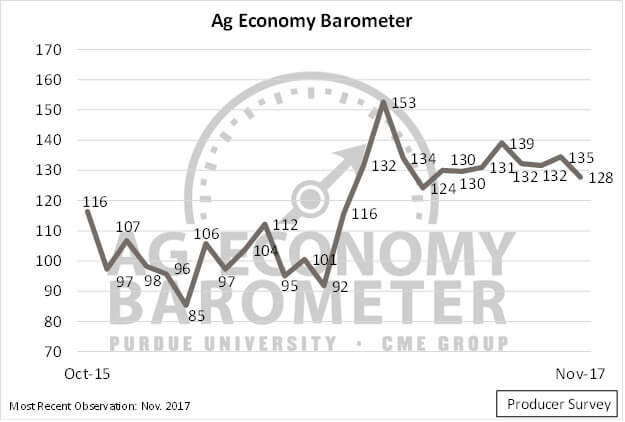 Note to journalists: The December Ag Economy Barometer Report will publish on Tuesday, January 9, 2018, due to Purdue University's winter recess. Download the full reports schedule.